Pic: Kildare Credit Union Kilcullen. 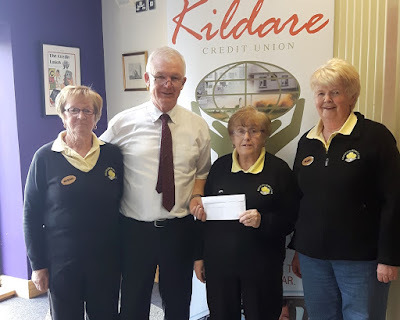 Kilcullen Indoor Bowls Club has been presented with funds from Kildare Credit Union Kilcullen under the organisation's Outreach Programme for 2018, writes Brian Byrne. Members are pictured above accepting the cheque from Pat Stafford, manager of the Kilcullen branch. The club was one of 11 organisations in Kilcullen which received grants from the Credit Union's programme for 2018. They also included the Kilcullen Canoe Club, Camphill Community, Cross and Passion College, Kilcullen Community Action, Kilcullen Community Centre, Kilcullen Cycling Club, the Dawn Walk for Pieta House, the Maintain Hope charity, St Bridget's Pitch and Putt Club, and St Josephs National School, Halverstown. A total of 50 applicants across the Credit Union's area received funding of various amounts.